Now that’s trendy – workwear for work! best outfit out of the 3 pictures you’ve posted today. One of my heroes–in a shot worthy of him. Love the face and use of his mouth. 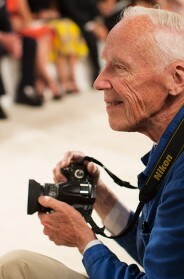 He’s so focused…Bill Cunningham is awesome! Ignoring his camera and his facial expression though, that puddle and his stance don’t go well together, or maybe just a little too well…and I blame that thought on your caption. first guy cute and stylish, but not thrilling. looks good. second guy (photog) is great looking. love the hat and the shoes w/ khakis. i’m ignoring his garbage bag slicker. functional, non? I adore this man! A friend who lives in the West Village sees him riding around all the time. I love listening to his commentary on the New York Times Web site. He’s so energetic and spirited. Keep it up, Bill! It is a very lovely shot! LLBean duck boots and a poncho? Bill is THE MAN. Hemingway is giving him a postmortem high five. Love him! Is that his bike in the background? I was going to ask again when you were publishing a book of your photos, but I will add, where is one of his incredible work? The NYTimes should put out some giant tome of the best of the Sunday fashion trend pix. Oh yes, more older gent (and lady) photos please, Sart! Merci. wow, that’s an amazing capture of him! He is the master! Great shot! Great photo, Scott. I love everything going on here. LL Bean duck boots, khakis, tweed cap, and short hair: what more could a chap want? Bill is just AWESOME! I love hearing and seeing his commentary on the NY Times website. His enthusiasm for fashion trends is really inspiring. Something to note is that he is a bike rider (a big plus in my book) which is probably why he looks so great for his age. Wonderful picture! You photographers are like heroes sometimes! I love those shoes! Love the shot. The posture and the mouth-grab are so youthful. magster mash.. my thoughts on teh puddle and caption exactly!!! now, that is how you rock a garbage bag on a horrid day. You could give your forefather a little more props than “he just goes and goes”… Where’s the respect?? Would you even be doing this without his pioneering ways? Did Bill get a photo of you??? Bill Cunningham is one-of-a-kind. I always look forward to his Sunday street fashion column. Have you and he ever talked or do you just acknowledge each other when your paths cross? Haha! ^^ he sure looks pretty intent on getting some pictures, today. 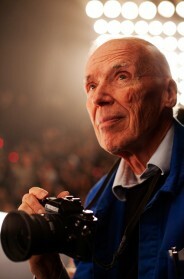 Bill Cunningham is wonderful but the best thing about him is his voice! I love the audio tracks he does for NYT online. He is the only part of the Sunday Styles section that will never go out of fashion. perfect photo scott. great work. Seeing HIM out on the street is nice for a change. He’s got such a good spirit and warmth. I really dig his column (the multi-media one on-line). He always sounds so enthusiastic about the most simple things. He’s absolutely lovely. I wonder, is he shooting with a digital camera? Wow! The man in action. 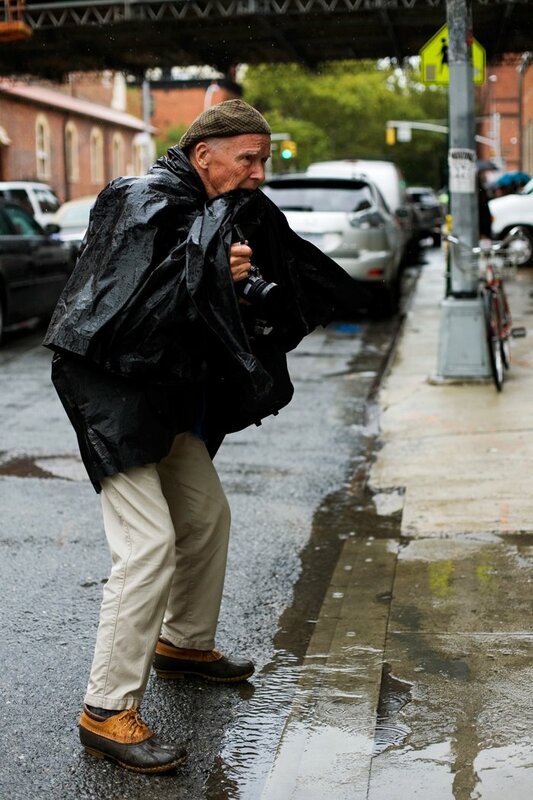 Bill Cunningham is my go-to for street fashion (after the sartorialist, of course). I love to hear his comments-he always seems so tickled! what is he clicking ??? One of the most talented, charming, humble men you’ll ever meet. One if the nicest, humblest, knowledgeable men you will ever meet. No digital for Bill yet. I’ve only seen him shooting old nikons. I think this is one of the best pictures you've ever posted. It's an important thing; it shows the way to be both functional & stylish, shows fashion in action. With some fashion shots, it's hard to imagine people ever moving in what they're wearing. Not so with this. Sart, what a lovely portrait of a lovely man. The New York Times now has a Sunday web feature with Bill's slideshow on a theme he's been pondering. Bill narrates it. His voice! I start looking for the feature days before Sunday. He is iconic, so modest and polite. A true gentleman and master photographer. Luv you, Bill! the Man just goes and goes…but he doesn’t jump puddles! I love him and his reportages for IHT…AMAZING BILL. 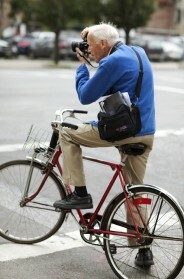 The first thing I have to look forward every Saturday moning is Bill Cunningham. I wake up, make a cup of coffee and listen to his audio commentary for the NY TImes. Thank you for showing this fantastic man in action! Ha! what are you two doing outside my storage unit? I absolutely love him, not sure what happened to my previous comment, but you and him are my fave pair of eyes in NYC. I adore Bill, I’ve posted some of his bike-pics. Love Bill and his lovely descriptions e/week @NYTimes. you are the continuation of bill’s work. i’ve seen you both working your tails off all over town this week! bill gets his prints done in my building and i always silently relish riding the elevator with him… i do miss his blue coat here though! This man is so cool!!! This guy is the best! I admire his attitude and work. It is funny cause I didn’t know much about the man..and now I see his name all over the place. Don’t you envy his 100% in-the-moment concentration? As for duck shoes – I wear mine with bright pink and yellow socks that I knit for myself. If the reaction from strangers is to be judged, this is very entertaining. Huray for galoshes and rain cape! His cap looks weather proof as well. Fashion at its most practical. Light pants look so much better dressed than blue jeans, I realise it now. I love all of his NYT photos/articles! I would so love to me him! I assume these are the pictures he shot that day! He is a true inspiration for fashion followers. When you have a real passion in life you have an endless drive! The Man!!!!! Lovely man! So talented!